Um. I made you a boozy shake! This past winter I teamed up with West Elm to bring you four summer fun boozy milkshakes – and now they’re here! Let me tell you… I drank this heavenly concoction back in February before I got pregnant and looking at these photos now… I’m just glad I got a sip. They are TOO good. I’m rambled for years about my favorite milkshake from DQ – a hot fudge shake – and it truly is still the best. In fact we just had one last weekend (and a few years ago I made a bourbon version) and I can never get enough. For some reason, they are so much better than regular vanilla or chocolate shakes. Just so dang good. Hence: a coconut version! 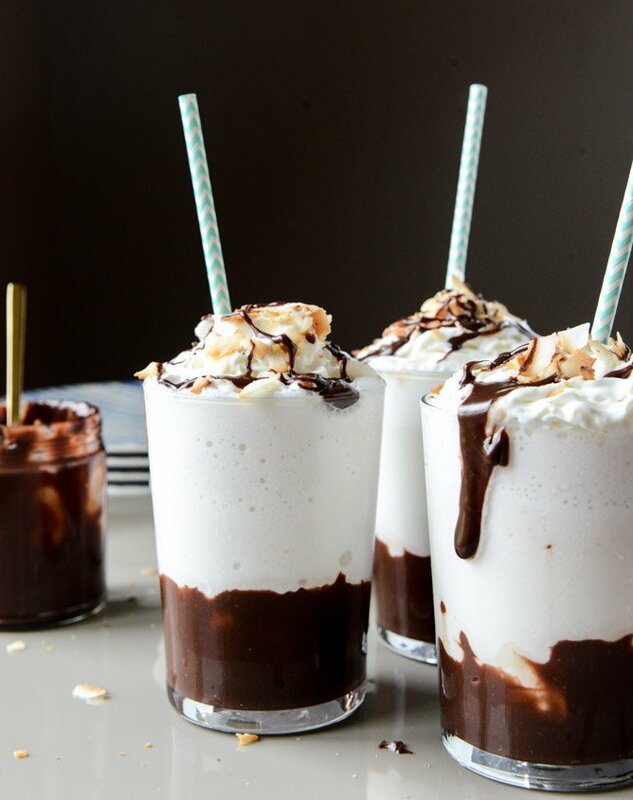 A layer of hot fudge, an icy coconut shake, piles of whipped cream, toasted coconut and an extra chocolate drizzle. SOLD. You can find the recipe right here over on the West Elm front & main blog. Drink up! Puhlease. Garlic Butter Salmon with Caramelized Shallot Relish. Can’t beat a boozy milkshake! Yum! Holy sweet goodness, this is awesome!!! I actually love everything about it. And I’m glad you got to try it pre-baby-in-belly…so much yum! Damn. It looks so gooooood! Wife is a sucker for fudge and coconut. I’m pretty sure she’d fall in love with me all over again for at least a week with this in her hand! DQ hot fudge shakes are the best!! I love the second picture. it led me to envision myself diving head first straight into that fudgy goodness. Those really sound amazing. Can’t remember the last time I had a boozy milkshake. I’m on it. These look so awesome and how crazy it must be for you to see something you made in Feb!! Oh the memories these images must have for you and how life has changed the past 6 months or so :) Gorgeous drinks & pinned! Too good! Saw this on the West Elm insta and pretty much died! Booze and chocolate. In one glass. Yes. Thanks for sharing this. Holy Moly… get in my belly. That hot fudge drizzle is killing me! Chocolate and booze.. nothing better than that! Oh yummyyyyy!!!!! Never tried DQ’s shakes, but I’m certain that these are probably much more fun to drink. Heading over there now, this sounds and looks incredible!! I’m totally going to make this. it looks absolutely heavenly! Looks so thick and chocolatey and YUM! Oh what a pity my other half doesn’t like coconut…guess that means more for me! Boozy is the way! These look amazing! 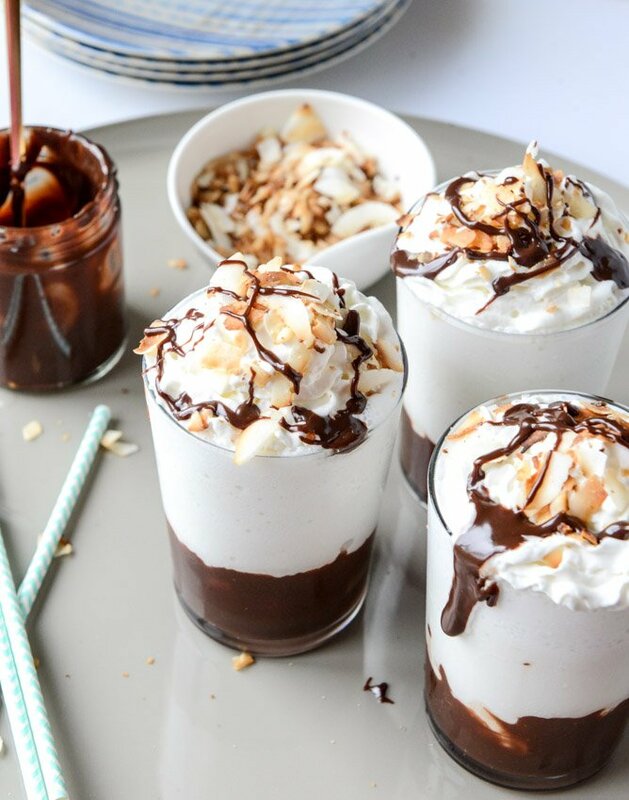 Chocolate, coconut and booze – oh heaven! How can you say no to a boozy shake, especially one this pretty?! Yum! Another GORGEOUS creation! You’re awesome!! I almost just shot cranberry juice out of my nose when I saw these. I need them… bet they wouldn’t burn as bad as the juice in near snorting accidents. And I bet they just taste way better! These look amazing — putting it on the menu for our anniversary in a few weeks. Thanks Jessica! You’ve got me speechless. This sounds so wonderful! Hot fudge should be in every milkshake! Just emailed this to my friend at work to torture her for ditching me yesterday :D.
Dear God this looks incredible. Oh my yum! Your pics are always amazing and let me crave instantly! Holy crap these look SO delicious!! Hot fudge shakes are pretty good, but have you tried a DQ hot fudge malt? Oh baby! That’s the only thing I order when I go there. I have a feeling this boozy concoction is a million times better though. Oh hot fudge! I am in heaven with this shake. Hot Damn!! Shut the front door delish! Yes to all of this! It looks so amazing!